Bodybuilders, like most other professional athletes in the last four decades, have undergone an unprecedented change. Whereas the first Mr. Olympia weighed in at just over 200 lbs, the modern champion is more likely to be sixty pounds heavier and leaner as well. While the reasons for this, at least in bodybuilding, are clear, it is still interesting to reflect upon this change. Today’s short post discusses the average weight for the overall Mr. Olympia since it’s inception and shows how and when ‘the mass monsters’ gained a foothold in the sport. Having previously discussed the first ever Mr. Olympia contest held in 1965, it was a great and welcomed surprised to stumble across this report on the ’66 Olympia. Featuring a host of names from the golden age of bodybuilding, there’s something almost quaint about the sportsmanship and seeming politeness of this particular show. Especially when compared with the strictly professionalised competitions held nowadays. The big question in 1966 was of course whether Larry Scott, the champion from the previous year, would retain his coveted title. At the risk of spoiling anything, I’ll just say read on! How bodybuilding champions train is an area of intense interest for muscle fanatics the world over. How many sets, how many reps and how intensely? What makes them great? Seeking to satisfy demands, muscle magazines often publish polished workout routines written by the Champions. Yet nothing compares to the first article, making today’s post on Steve Michalik’s 1968 training diary just so fascinating. In it we see Steve’s hopes for the future regarding the stage and also his thoughts on training poundages an intensity. 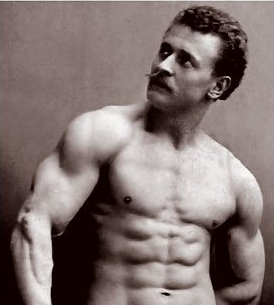 A gem of a find that I stumbled across on Dave Draper’s excellent bodybuilding website and forum. You can check out the training diary below. Part one and two of this series detailed the creation of the World Bodybuilding Federation and the first ever WBF show in June 1991. Today’s third and final installment looks at how drug accusations, no-show Hulks and poor conditioning brought down the radical bodybuilding experiment.